For the past month or two I've had problems with surfing the web on my Palm TX. If you've followed my blog at all I know you may be thinking that I'm not the biggest fan of Palm. I'm not, but I do love the TX. I keep at home to ensure that the app that we use to sync Notes to people that have TX's, Pocket PC's and even a few Treo's, still works correctly. Recently I've had an issue where any of the websites that I visit that require login, (Facebook, Gmail, Twitter), will not keep my login information saved like it used to. Every day, or even ever time I go to the sites, I have to enter my username and password and this has never been a problem in the past. So today I decided to be a little daring and try to resolve the issue. 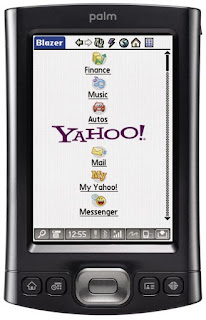 I started by backup up the Palm Pilot, doing a hard reset and then restoring the data to the device. That didn't help. I then noticed that when I went into App-Delete menu, I saw the file Blazer Cookies size was pretty big, around 900k. Okay, that's big enough for a Palm Pilot I figured. After not finding any good ideas after hitting Google up for an answer, I deleted that file and restart the browser. Since then, I've remained logged into the sites I normally visit on the device and the browser is respoding much better. I was having the same problem with my device and tried several times to clear the cookies, only to find that the cookies would immediately return to the max memory size (250K). After doing the hard reset, I noticed the problem resolved -- until I re-synched in all my data, which included rewriting the Blazer Cookies file from the backup. Then the problem recurred. I then stumbled on this blog entry and tried what you suggest -- deleting the Blazer Cookies file in the App/Delete. That seems to have solved the problem. I think I had picked up a rogue cookie that was overwriting all other cookies, so that not only was I logged out of gmail,facebook etc but could not log back in because those sites could not place the necessary cookie in my overfull cookie directory. In short, I think its a virus being planted by a cookie.